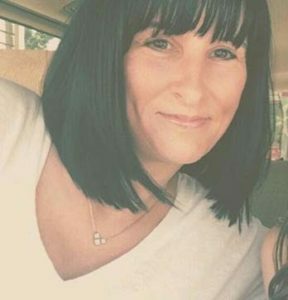 Hi, my name is Tracey, I’m 48-years-old, married and have two daughters. I’ve had RSD for 21 years. My RSD story starts in Jan 1998. A toy V-Tech computer fell on my left foot, fracturing two toes and crushing the MT joints (toe knuckles). 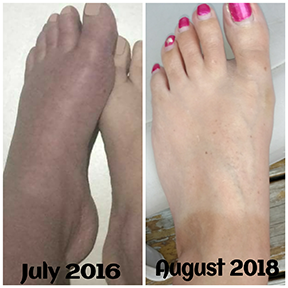 After two weeks, I knew something was wrong so I saw a podiatrist, who by the 2nd appointment diagnosed me with RSD. He sent me to a vascular surgeon who confirmed the diagnosis. I went through 6 blocks and a 6-day epidural over 6 weeks. All worked, but wore off within 24 hours or less. But I found the RSD came back fighting, worse after each treatment. My leg was now on fire, but ice cold and so discolored from my groin to my toes. It looked like someone colored my leg with a magic marker. The decision was made to do a sympathectomy, which was done on March 16th, less than 2 months after the initial injury. The morning of my surgery, my big toe was beginning to get gangrene. Well, it worked, I went into remission for four years. I went back to work, got married and had my second daughter. When she was two, she had her tonsils removed and I stayed in the hospital with her. I fell asleep in the bed with her, not realizing that my foot was pressed up against the footboard. I awoke the next morning stood up and it was back, I could not put any weight on my foot at all without excruciating pain. I saw my Dr that week and he confirmed the RSD was back. My only real option was meds because the sympathetic nerve was gone down my left leg. It had started to regrow at the base of my spinal cord a 1/4 of an inch, that very tiny growth was enough for it to come back. The RSD ended up going full-body over the next 5 years, I was bedridden 95% of the time. I tried more blocks, lidocaine infusions over the years, as the nerve grew more, but nothing worked. It continued to get worse. A friend suggested ketamine infusions with a pain specialist that she worked with, Dr. Robert Schwartzman, who was doing experimental ketamine infusions. I had to wait a year and a half for my appointment. I started the infusions in Jan 2007. I went initially for 10 days, then for 3 days every 2-3 months for booster infusions over a period of 10 years. The first 8 years worked pretty well. During the last two years, it seemed the ketamine had stopped working. My pain went through the roof again and the RSD started to spread to my right leg. My last infusion was in December 2016. 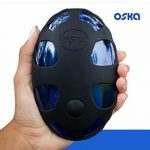 In April 2017, I started using the OSKA Pulse Device and that has brought my pain down to almost nothing. It’s helping with so many different symptoms and I have been able to take back my life and do the things I love to do again. I’m getting better relief from the OSKA than I did from the infusions. 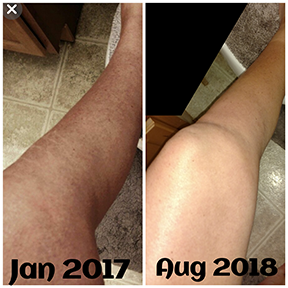 My pain was an 8/9/10+ on a bad day, the RSD was starting to spread into my right leg and a good day was a 5/6, with the infusions. My pain today is a 1/2 on a good day, and a 3 on a bad day, which is rare. The weather doesn’t bother me anymore. I use to get 3-5 migraines every week and I have not had one since I started with OSKA. I also use to get shocking/electrocution type pains down my leg, those have stopped too. I haven’t had a flare in over a year. The swelling and discoloration are also gone. I’m in the process of decreasing my pain patch. I should be totally off it in a few months, then I’ll be off all meds. I have managed to find some good in the bad and have started drawing Awareness pictures to keep my mind off my pain. That’s led to a Facebook Artwork page and a store on Zazzle where my designs are available on T-shirts, Fleece Blankets, Leggings, Mugs and many other items. I have items for over 40 different illnesses. I have made several donations with my royalties and plan to make more as time goes on. Below is some information on the OSKA Pulse Device and some pictures of my RSD foot & leg before and after using the OSKA for several months. Oska Pulse is a small portable PEMF (pulsed electromagnetic frequency) device. It’s the size of a cell phone. It has no wires or electrodes, and can be used anytime anywhere. It charges like a cell phone. It decreases inflammation, increases blood circulation and improves range of motion. It works on a cellular level. Oska Pulse uses optimized PEMF to restore the electrical potential cells need to receive nutrients and oxygen, which stimulates cellular regeneration—relieving pain, and activating the body’s natural healing process. It works great for all types of conditions including RSD/CRPS, POTS, Fibro, Lyme, MS, RA, TMJ, Migraines, Endometriosis and much more. I have a list of 150+ different conditions that PEMF can treat. The great part is it doesn’t even have to touch your body to work. You can strap it to you, your arm, back, leg etc. Or you can just set it next to you or the affected area. You can put it in your pocket or your purse, on your lap, it will still work. You don’t feel anything, no tingling, no zapping, no vibration, nothing. There are no side effects that have been reported. If it’s used properly, at least 6-8 times a day consistently, more if you choose to, it should work and give you pain relief. You have to be consistent and patient. Some people see results within 2-4 weeks, others it may take up to 2 months. Everyone is different but once you start to feel results, they only get better with continued use. It’s not a cure, but can reduce the pain so that you can get back to life and doing things you used to do. $55 will be automatically taken off at checkout so the cost will be $344 USD. You’ll also get free shipping in US and a 30-day full money back guarantee. If this link is used, the company is willing to give an extension to 60 or 90 days on the guarantee if needed. Editor’s Note OSKA is a corporate sponsor of RSDSA. Our blog is not intended to provide advice on personal medical matters, or to substitute for counseling with a physician. We asked Ms. Morales to share her story as she been a member of RSDSA’s community for many years and has responded well to this treatment and OSKA does offer a 30-day money back guarantee and they mean it.